Properties in Whittington average 4.7 out of 5 stars. Property 3: CREEK SIDE VILLA LOCATED PERFECTLY BETWEEN HOT SPRINGS VILLAGE AND HOT SPRINGS! Property 5: Cozy Cabin on the Water!!! Fox Pass Cabins...Home of the Hillbilly Hiltin! Southern Comfort at it's BEST! Property 7: Fox Pass Cabins...Home of the Hillbilly Hiltin! Southern Comfort at it's BEST! Relax & Enjoy a Spring Break Getaway in this Cozy Cabin on 40 Acres. Property 15: Relax & Enjoy a Spring Break Getaway in this Cozy Cabin on 40 Acres. Spectacular Lake Front Home on Lake Balboa! Property 18: Spectacular Lake Front Home on Lake Balboa! Book Now!! RACING SEASON JAN thru MAY!! 15 minutes from OAKLAWN PARK!! Property 20: Book Now!! RACING SEASON JAN thru MAY!! 15 minutes from OAKLAWN PARK!! Lakefront! Main Channel Lake Hamilton Large Decks & Boat Dock! Spectacular View! Property 24: Lakefront! 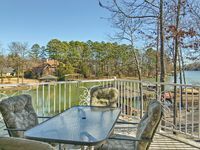 Main Channel Lake Hamilton Large Decks & Boat Dock! Spectacular View! Property 26: Beautiful and private lake front home! Property 27: SPRING BREAK on the LAKE! Luxury waterfront home. March dates available! Perfect lakefront home with awesome large screen room for family fun!!! Property 33: Perfect lakefront home with awesome large screen room for family fun!!! Property 38: Lake Getaway with Happy Vibes! Great winter rates! The lake is your front yard! New Deck 2019! Private boat parking! Property 39: The lake is your front yard! New Deck 2019! Private boat parking! Lake Hamilton Rest, Relaxation, and Fun Seekers Welcome here!!!! 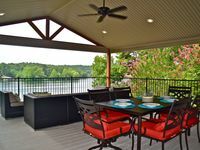 Property 43: Lake Hamilton Rest, Relaxation, and Fun Seekers Welcome here!!!! This beautiful home made our annual trip to Hot Springs even more enjoyable then ever. Comfortable sleeping, Giant Kitchen, and plenty things to do. We will be back! The house was very spacious and all rooms were comfortable. The owners were not only accommodating (on short notice), but the house contained little extras that other houses I have rented have not had. The Garvin Gardens was a great suggestion. It was absolutely beautiful and not far from the house. We enjoyed the house and the surrounding area and will be back.